"Indy. Where'd you get a name like that? Your dog?" The Great War is coming to an end for Indy, and with it his adventures as a spy for the Belgian government in this third volume of The Adventures of Young Indiana Jones. This set of episodes, appropriately titled "The Years of Change" includes several WWI-adventures, leading into young Indy's travels as a student at the University of Chicago. Along the way, he duels with Ernest Hemmingway for a girl's heart, makes time with an aging Edith Wharton, meets Al Capone, makes movies with John Ford, and even battles an undead Vlad the Impaler. Sean Patrick Flanery, as the only real series regular, carries the weight of the series, and the legacy of Indiana Jones, on his shoulders, and does so admirably. Edu-tainment, thy name is Young Indiana Jones. Not that there's anything wrong with that. When the show works, which isn't all the time, the historical scenarios really click with the action in a way that's fun for history buffs, and a nice entry point for the uninitiated. The episode where Indy hunts down Dracula, for example, is a jarring break from the tone of the series, but provides some background into the historical Romanian lord on whom that character was largely based. There's an unevenness throughout the series, but things seem to gel a bit better in this set than in prior episodes. Blissfully gone is some of the lame comic relief of earlier episodes. Indy's friend Remy (Ronny Coutteure), whose sole purpose was to lighten the mood by being really fat and complaining about doing stuff, has departed (though he does put in a toned-down appearance in Treasure of the Peacock�s Eye). That late-era George Lucas version of funny was beneath a show that seemed desperate to be classy, if sometimes to the exclusion of all else. The series as a whole, in fact, has a consistent problem with tone: it wants to be fun, while brining a new level of 'quality' to television. It can also get a little showy in shoe-horning in historical events and personages. Zelig-like, in episode after episode, Indy seems to know exactly where the history will happen. It's all well and good to ask for suspension of disbelief, but it can all become a bit much. I suppose that it wouldn't do the mixed-age target audience much good to show Indy hanging out with his buddy Ernest Hemingway (in Tales of Innocence) without making it really obvious, but still. Fortunately, these later episodes display a bit of subtlety on that front: the history doesn't draw attention to itself in quite the way that it did earlier on. In spite of the darker turns plot-wise that a couple of these episodes take, they have a confidence and briskness that wasn't there early on in the show. While I have to admit being bored, if not quite to tears, by previous episodes, the collection here is mostly solid. The last three college-years films are a bit weaker than the rest, but I found them enjoyable all the same. Naturally, for a George Lucas presentation, these aren't the original episodes as aired on TV. As in the mid-90s VHS releases, the original one-hour episodes have been edited together, in chronological (rather than airdate) order, to create two-hour 'films.' I t works quite well in some instances, though in others the combined episodes have little to do with each other. I suppose it's meant to give the series a more theatrical feel, but I'm not sure that the approach really adds or subtracts. Book-end appearances by an actor portraying an elderly Indiana Jones were cut from earlier episodes, so it wouldn't surprise me if other small changes have been made. There's nothing egregious, so unless you have the original televised episodes memorized, I doubt that you'd find any edits offensive. Perhaps they should have ditched the Harrison Ford bookend in The Mystery of the Blues, where the bearded archaeologist shows up in a slightly silly adventure about nefarious, bad-guy types chasing a Native American relic. Were it not for the new movie, this would have been the last we'd have seen of Indiana Jones. Because these episodes have been combined, it's hard to pick out favorites. The second half of Tales of Innocence, where Indy romances Edith Wharton in 1917 Morocco is a highlight, as is the first part of Masks of Evil with a standard, but well-done espionage adventure in Istanbul. Treasure of the Peacock's Eye is a particular highlight as well, and plays a bit more like the kind of thing you'd actually expect from Indiana Jones: a solid archaeological adventure. The series tries too much to be classy and educational, and loses much of the spirit of the movies in the process. Still, I find it enjoyable enough on its own merits, if a bit overdone. Image Transfer Review: The show is presented in its original fullframe aspect ratio. Having seen a few of these episodes on TV over the years, it looks like Lucasfilm put a lot of effort into cleaning the show up for DVD. Shot on film, the DVD restoration has left the colors bright, and the overall image crisp. There's some uneveness; the picture is soft in places, for instance, which I'd suspect is the result of mildly aged source material. The seven two-hour episodes are spread across ten discs, so they've been given some room to breathe. Audio Transfer Review: The Dolby 2.0 track is pretty good, but it's a little weak considering the action-oriented source material. The explosions, car chases, and plane battles would seem to be tailor-made for an expansive, multi-track stereo presentation. Instead, there's a perfectly adequate two-channel track. Extras Review: Here�s where the box set really shines. As a history-lover, and an Indiana Jones fan, I had a ton of fun digging through these discs. Each episode includes three to six quality documentary features, of around a half-hour each. There are 31 in total, and they don�t all shy away from some of the more obscure people and events in the episodes. There are no making-of features, but there�s plenty here nonetheless. Features include Unhealed Wounds-The Life of Ernest Hemingway, Dracula-Fact and Fiction, Bronislaw Malinowski-God Professor, Gertrude Bell-Iraq�s Uncrowned Queen, Louis Armstrong-Ambassador of Jazz, Tin Pan Alley-Soundtrack of America, and The World of John Ford. Those are just examples, but you get the idea. The Winds of Change episode alone has six documentaries, which are granted their own disc. Mystery of the Blues likewise has seven features, also on their own disc. That's how seven two-hour episodes managed to spread themselves across ten discs. 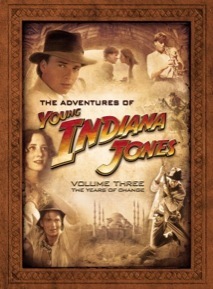 That tenth disc includes three bonus features independent of the individual episodes: the Interactive Timeline is a DVD-ROM feature that includes a world map, as well as Indy�s journal. From this feature you can navigate through the timeline of the series, and view bits of documentaries from all three collections. New Gods for Old is an hour-long lecture from the charismatic H.W. Brand. There�s also a Treasure Hunt game, based on the Peacock�s Eye episode, which is a combination of animated comic book and puzzle game. A little convoluted, but fun. Young Indiana Jones never quite clicks. Only in these last episodes does the series begin to establish a consistent tone and quality, and it's just too late. Still, the show's high production values and overall quality of writing and acting make it worth checking out for fans of Indy or historical drama in general. Where this set really stands out is the extensive extras, with literally hours of quality historical material provided for each episode. That may sound like torture to some, but history buffs will be in heaven. The folks at Lucasfilm have put a lot of love and money into presenting this show, and the result is one of the finest TV box sets ever.